From: The Romance of the Rose by Guillaume de Lorris and Jean de Meun. Translated by Charles Dahlberg (Princeton University Press, 3rd edition, 1995). The above was written c1275 by Jean de Meun. 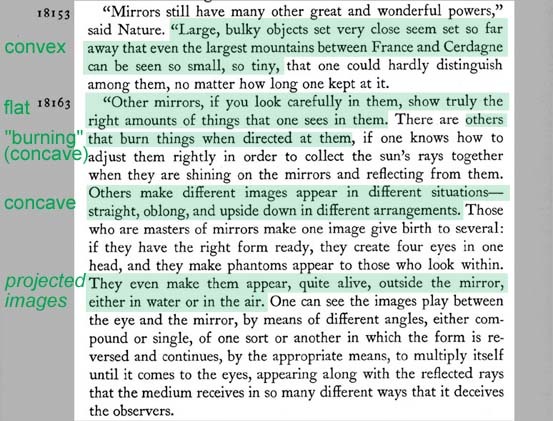 Spread across four pages of The Romance of the Rose are descriptions of what the book simply calls “mirrors.” Remarkably, the detailed depictions of the various “great and wonderful powers” of such mirrors in just the above two paragraphs leave no doubt that they refer to convex and concave as well as to flat mirrors. Even more remarkably, by making the clear distinction between the “phantoms” that “those who are masters of mirrors” can make appear to people who look “within” a mirror, and those they can make appear “quite alive, outside the mirror,” we are given as unambiguous a description of images projected by concave mirrors in the 13th century — 150 years before van Eyck — as anyone could hope to find.